Hi! It's Jilly. 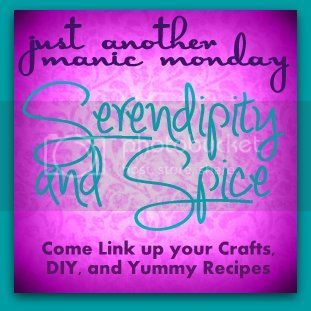 : Manic Monday- Co-hosting with Serendipity & Spice! Manic Monday- Co-hosting with Serendipity & Spice! I am SOOO excited to be co-hosting Manic Monday today with Melissa of Serendipity and Spice! I've been following her blog & linking up with Manic Monday for quite some time, so I feel super special being able to co-host this great party! Leave me a comment and say, "Hi!" if it's your first time visiting me...or if you aren't new and you just feel like saying "Hi!". ;) I can't wait to see all of your great projects! Here's Melissa with the rules and all that jazz. Follow Me if you please! You can follow through Facebook, Pinterest, BlogLovin, RSS, or Email. Who you can also follow through Facebook, Pinterest, RSS, Twitter, or BlogLovin. If you don't know how to put a backlink in your post here's a quick tutorial. You can also find out about Linky Party Etiquette here. 3. Limit yourself to 3 links Make sure you link directly to your post. Please don't link up other linky parties, posts not written by you, or advertising. Hey Jilly! I've nominated you for a blogger award :) I hope you will accept it! Have a great day! Thanks for the link up! Hope you're having a great week!